This article is about the sports announcer. For the American historian of architecture, see Vincent Scully. Vincent Edward Scully (born November 29, 1927) is an American retired sportscaster. Scully is best known for his 67 seasons calling games for Major League Baseball's Los Angeles Dodgers, beginning in 1950 (when the franchise was located in Brooklyn) and ending in 2016. His run constitutes the longest tenure of any broadcaster with a single team in professional sports history, and he is second only to Tommy Lasorda (by two years) in terms of number of years associated with the Dodgers organization in any capacity. He retired at age 88 in 2016, ending his record-breaking run as their play-by-play announcer. In his final season behind the microphone, Scully announced most Dodger home games (and selected road games) on SportsNet LA television and KLAC radio. He is known for his dulcet voice, lyrically descriptive style, and signature introduction to Dodger games: "It's time for Dodger baseball! Hi, everybody, and a very pleasant good (afternoon/evening) to you, wherever you may be." He is considered by many to be the greatest baseball broadcaster of all time, according to fan rankings, Bleacher Report and Fox Sports. Born in the Bronx, Scully grew up in the Washington Heights section of Manhattan. He worked delivering beer and mail, pushing garment racks and cleaning silver in the basement of the Pennsylvania Hotel in New York City. His father, Vincent Aloysius, was a silk salesman; his mother, Bridget, was a Roman Catholic homemaker of Irish descent from whom her son inherited his red hair. His biological father died of pneumonia when Scully was 4, and his mother later married an English merchant sailor named Allan Reeve, whom Scully considered "my dad." Scully attended Fordham Prep in the Bronx. Scully discovered his love of baseball at age 8 when he saw the results of the second game of the 1936 World Series at a laundromat and felt a pang of sympathy for the badly defeated New York Giants. Since he lived near the Polo Grounds and because he was a member of the NYC Police Athletic League and CYO, he was able to attend many games for free and became a "very big Giants fan". He decided, at the age of 8, that he wanted to become a sports announcer, fascinated as he was by football radio broadcasts. After serving in the United States Navy for two years, Scully began his career as a student broadcaster and journalist at Fordham University, where he majored in English. While at Fordham, he helped found its FM radio station WFUV (which now presents a Vin Scully Lifetime Achievement Award each year), was assistant sports editor for Volume 28 of The Fordham Ram his senior year, sang in a barbershop quartet, played center field for the Fordham Rams baseball team (wearing number 17), called radio broadcasts for Rams baseball, football, and basketball, earned a degree, and sent about 150 letters to stations along the Eastern seaboard. He received only one response, from CBS Radio affiliate WTOP in Washington, D.C., which made him a fill-in. Scully was then recruited by Red Barber, the sports director of the CBS Radio Network, for its college football coverage. Scully impressed his boss with his coverage of a November 1949 University of Maryland versus Boston University football game from frigid Fenway Park in Boston, despite having to do so from the stadium roof. Expecting an enclosed press box, Scully had left his coat and gloves at his hotel, but never mentioned his discomfort on the air. 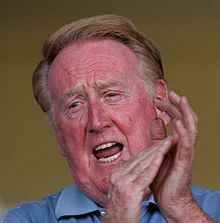 Barber mentored Scully and told him that if he wanted to be a successful sports announcer he should never be a "homer" (openly showing a rooting interest for the team that employs you), never listen to other announcers, and keep his opinions to himself. In 1950, Scully joined Red Barber and Connie Desmond in the Brooklyn Dodgers' radio and television booths. When Barber got into a salary dispute with World Series sponsor Gillette in 1953, Scully took Barber's spot for the 1953 World Series. At the age of 25, Scully became the youngest person to broadcast a World Series game (a record that stands to this day). Barber left the Dodgers after the 1953 season to work for the New York Yankees. Scully eventually became the Dodgers' principal announcer. Scully announced Dodgers games in Brooklyn until 1957, after which the club moved to Los Angeles. During that time, Dodgers broadcasts were heard over WMGM radio (1050) on the AM dial, as well as WOR-TV (channel 9) both in New York. Beginning with the 1958 season, Scully accompanied the Dodgers to their new location and quickly became popular in Southern California. During the Dodgers' first four seasons in Los Angeles, inexperienced baseball fans had difficulty following the action in the very large Los Angeles Memorial Coliseum, and it soon became common for them to bring transistor radios to the games to hear Scully and partner Jerry Doggett describe the action. This practice continued even after the team moved to the much smaller Dodger Stadium for the 1962 baseball season. Radio and television engineers often had difficulty compensating for the sound of Scully's play-by-play reverberating through the stands at Dodgers home games. In 1964, the New York Yankees offered Scully the job to replace the recently fired Mel Allen as their lead play-by-play announcer. Scully declined the offer and chose to remain with the Dodgers. By 1976, his popularity in Los Angeles had become such that Dodger fans voted him the "most memorable personality" in the history of the franchise. Unlike the modern style in which multiple sportscasters have an on-air conversation (usually with one functioning as play-by-play announcer and another as color commentator), Scully and his broadcast partners Jerry Doggett (1956–1987) and Ross Porter (1977–2004) called games solo with Scully working the entire game except for the 3rd and 7th innings. When Doggett retired after the 1987 season, he was replaced by Hall-of-Fame Dodgers pitcher Don Drysdale, who previously broadcast games for the California Angels. Drysdale died in his hotel room following a heart attack before a game against the Montreal Expos in 1993, resulting in a very difficult broadcast for Scully and Porter, who were told of the death but could not mention it on-air until Drysdale's family had been notified and the official announcement of the death made. Scully announced the news of his death by saying, "Never have I been asked to make an announcement that hurts me as much as this one. And I say it to you as best I can with a broken heart." On August 28, 2015, the Dodgers announced—via a series of cue cards presented by comedian Jimmy Kimmel on the Dodger Stadium video board—that Scully would be back for the 2016 season, his 67th with the Dodgers. At a press conference August 29, Scully said 2016 would probably be his final year. "I mean, how much longer can you go on fooling people? So yeah, I would be saying, 'Dear God, if you give me next year, I will hang it up.'" Scully's final regular season game broadcast from Dodger Stadium occurred on September 25, 2016. His final game was broadcast from San Francisco's AT&T Park on October 2, 2016. Like Red Barber and Mel Allen in the 1940s, Scully retained his credentials in football even as his baseball career blossomed. From 1975 to 1982, Scully announced National Football League telecasts for CBS Sports, teaming with several different color analysts including Sonny Jurgensen, Paul Hornung, Alex Hawkins, George Allen, Jim Brown, John Madden, and Hank Stram. One of his most famous NFL calls was that of Dwight Clark's touchdown catch in the NFC Championship Game on January 10, 1982 (which Scully called with Stram as his final NFL telecast for CBS), that put the San Francisco 49ers into Super Bowl XVI. Montana ... looking, looking, throwing in the endzone ... Clark caught it! Dwight Clark! ... It's a madhouse at Candlestick! Scully also contributed to the network's tennis and PGA Tour golf coverage in the late 1970s and early 1980s, usually working the golf events with Pat Summerall, Ken Venturi, and Ben Wright. From 1975 to 1982, he was part of the team that covered the Masters tournament for CBS. Scully's network commitments led to his working a reduced schedule with the Dodgers, who hired Ross Porter to help pick up the slack. In 1977, Scully began his first of two stints calling baseball for CBS Radio, broadcasting the All-Star Game through 1982 (usually paired with Brent Musburger) and the World Series from 1979 to 1982 (alongside Sparky Anderson). Scully decided to leave CBS in favor of a job calling baseball games for NBC (beginning in 1983) following a dispute over assignment prominence (according to CBS Sports producer Terry O'Neil, in the book The Game Behind the Game). CBS decided going into the 1981 NFL season that John Madden, whom CBS had hired in 1979 and who had called games alongside Frank Glieber and Gary Bender his first two years, was going to be the star color commentator of their NFL television coverage. But they had trouble figuring out who was going to be his play-by-play partner, since Scully was in a battle with CBS' lead play-by-play announcer Pat Summerall for the position. At the time Scully was the number two announcer for CBS, a position he had held since 1975, and was calling games alongside the former Kansas City Chiefs head coach Hank Stram, who had been promoted from CBS' number three broadcast team alongside Curt Gowdy. To resolve the situation, both Scully and Summerall were paired with Madden in four-week stretches, which coincided with each of their respective absences due to other engagements. While Summerall was away calling the US Open tennis tournament for CBS as he did every September, Scully called the first four weeks of the season alongside Madden. After that Scully went on to cover the National League Championship Series and World Series for CBS Radio, as he had done for the past few Octobers, and Summerall returned to the broadcast booth to work with Madden. Scully then teamed with Stram for the remainder of the NFL season. After the eighth week of the NFL season, CBS Sports decided that Summerall meshed more with Madden than Scully did and it named him to be the announcer who would call Super Bowl XVI for CBS on January 24, 1982, at the Pontiac Silverdome. An angry Scully, who felt that his intelligence had been insulted by the move, was assigned as a consolation prize that year's NFC Championship Game, which he called alongside Stram. Summerall took Stram's place alongside Jack Buck to call the game over CBS Radio. Outside of Southern California, Vin Scully is remembered as NBC television's lead baseball broadcaster from 1983 to 1989. Besides calling the Saturday Game of the Week for NBC, Scully called three World Series (1984, 1986, and 1988), four National League Championship Series (1983, 1985, 1987, and 1989), and four All-Star Games (1983, 1985, 1987, and 1989). Scully also reworked his Dodgers schedule during this period, broadcasting home games on the radio, and road games for the Dodgers television network, with Fridays and Saturdays off so he could work for NBC. Teaming with Joe Garagiola (who was the full-time lead play-by-play man for NBC's baseball telecasts from 1976 to 1982 before converting into a color commentary role to work with Scully) for NBC telecasts (with the exception of 1989, when he was paired with Tom Seaver after Garagiola left NBC Sports following the 1988 World Series due to a contract dispute), Scully was on hand for several key moments in baseball history: Fred Lynn hitting the first grand slam in All-Star Game history (1983); the 1984 Detroit Tigers winning the World Series (along the way, Scully called Tigers pitcher Jack Morris' no-hitter against the Chicago White Sox on April 7); Ozzie Smith's game-winning home run in Game 5 of the 1985 National League Championship Series; the New York Mets' miracle rally in Game 6 of the 1986 World Series; the 1987 All-Star Game in Oakland, which was deadlocked at 0–0 before Tim Raines broke up the scoreless tie with a triple in the top of the 13th inning; the first official night game in the history of Chicago's Wrigley Field (August 9, 1988); Kirk Gibson's game-winning home run in Game 1 of the 1988 World Series; and chatting with former President of the United States Ronald Reagan (who said to Scully, "I've been out of work for six months and maybe there's a future here.") in the booth during the 1989 All-Star Game in Anaheim as Bo Jackson hit a lead off home-run. On Saturday, June 3, 1989, Scully was doing the play-by-play for the NBC Game of the Week in St. Louis, where the Cardinals beat the Chicago Cubs in 10 innings. Meanwhile, the Dodgers were playing a series in Houston, where Scully flew to be on hand to call the Sunday game of the series. However, the Saturday night game between the teams was going into extra innings when Scully arrived in town, so he went to the Astrodome instead of his hotel. He picked up the play-by-play, helping to relieve the other Dodger announcers, who were doing both television and radio, and broadcast the final 13 innings (after already calling 10 innings in St. Louis), as the game went 22 innings. He broadcast 23 innings in one day in two different cities. Laryngitis prevented Scully from calling Game 2 of the 1989 National League Championship Series between the San Francisco Giants and Chicago Cubs. Bob Costas, who was working the American League Championship Series between Oakland and Toronto with Tony Kubek for NBC, was flown from Toronto to Chicago to fill in that evening (an off day for the ALCS). The final Major League Baseball game that Scully called for NBC was Game 5 of the 1989 NLCS on October 9. There, the Giants led by first baseman Will Clark clinched their first National League pennant since 1962. After the 1989 season, NBC (along with ABC, with whom NBC had shared baseball coverage since 1976), lost the television rights to cover Major League Baseball to CBS. For the first time since 1946, NBC would not televise baseball. In the aftermath, Scully said of NBC losing baseball, "It's a passing of a great American tradition. It is sad. I really and truly feel that. It will leave a vast window, to use a Washington word, where people will not get Major League Baseball and I think that's a tragedy. ... It's a staple that's gone. I feel for people who come to me and say how they miss it and, I hope, me." Scully also served as an announcer for NBC's PGA Tour golf coverage during his time at the network, usually teaming with Lee Trevino. After the National League Championship Series in 1989, Scully's NBC contract was up and he left to focus primarily on his duties with the Dodgers. Scully also returned to being the national radio announcer for the World Series, since CBS Radio gave him the position that Jack Buck had vacated in order to become the primary announcer of CBS-TV coverage of Major League Baseball. Scully's first assignment was the 1990 World Series and he remained in that role until 1997, working with Johnny Bench for the first four years and Jeff Torborg for the final three. After ESPN Radio acquired the World Series radio rights from CBS in 1998, Scully was offered a continued play-by-play role but declined. Instead, ESPN Radio used Sunday Night Baseball television play-by-play man Jon Miller for their World Series coverage for the next thirteen years. From 1991 to 1996, Scully broadcast the annual golf Skins Game for ABC, having previously called the event for NBC from 1983 to 1989. He also called the Senior Skins Game for ABC from 1992 to 2000, as well as various golf events for TBS during this period. In 1999, Scully was the master of ceremonies for MasterCard's Major League Baseball All-Century Team before the start of Game 2 of the World Series. The Dodgers management announced in February 2006 that it had extended Scully's contract through the 2008 baseball season for about $3 million per year. For health reasons, beginning around 2005, Scully no longer called most non-playoff games played east of Phoenix. Exceptions to this rule were the 2007 opening series in Milwaukee, a series against the Chicago Cubs in 2007, a series against the Boston Red Sox in 2010, and the series in Australia against the Diamondbacks that opened the 2014 baseball season. He was also not normally scheduled to announce Dodgers games (on either radio or TV) that were televised by ESPN on Sunday Night Baseball or by Fox on the Saturday Game of the Week. As of his final season in 2016, Scully called approximately 100 games per season (all home games and select road games in San Francisco, San Diego, and Anaheim) for both flagship radio station KLAC and television outlet SportsNet LA. Scully was simulcast for the first three innings of each of his appearances, then announced the remaining innings only for the TV audience. If Scully was calling the game, Charley Steiner took over play-by-play on radio beginning with the fourth inning, with Rick Monday as color commentator. If Scully was not calling the game, either Joe Davis or Steiner would call the entire game on television with Orel Hershiser and Nomar Garciaparra on color commentary. while Monday, now doing play-play, joined Kevin Kennedy on radio. Through 2014, in the event the Dodgers were in postseason play, Scully called the first three and last three innings of each radio broadcast alone, with Steiner and Monday handling the middle innings. Scully missed most of the Dodgers' opening homestand of the 2012 MLB season (the first five out of six games) because of an illness. Scully returned to the announcers' booth on April 15, 2012, which was the 65th anniversary of Jackie Robinson's breaking of the color barrier in baseball. It was just the second time in 35 years the legendary sports broadcaster had missed a Dodger Stadium home opener: The first time was when he was busy broadcasting the Masters golf tournament for CBS in 1977. On January 31, 2016, Scully announced that he planned to retire from broadcasting after the conclusion of the 2016 season; his final game was the team's October 2 finale at San Francisco. Scully left open the possibility of calling postseason games (but not the World Series) if the Dodgers were to advance; in September, however, Scully stated that he would retire after the end of the regular season and not call postseason games because he did not want to "say goodbye 12 different times." Scully was assigned a total of six road games for the 2016 season: the opening game in San Diego, two games in Anaheim, and the entirety of the three-game regular-season closing series in San Francisco. Scully was honored by the Dodgers during their September 23 home game against the Rockies, which featured a pre-game ceremony that paid tribute to his career. The ceremony included speeches by Commissioner of Baseball Rob Manfred, Sandy Koufax, Clayton Kershaw, Mayor Eric Garcetti, the team's Spanish play-by-play man Jaime Jarrín, Kevin Costner, and Scully himself. The team also unveiled that Kirk Gibson's 1988 World Series home run had been named the most memorable Vin Scully call in a fan vote. You and I have been friends for a long time, but I know in my heart that I've always needed you more than you've ever needed me, and I'll miss our time together more than I can say. But you know what? There will be a new day and eventually a new year. And when the upcoming winter gives way to spring, rest assured, once again it will be "time for Dodger baseball." So this is Vin Scully wishing you a very pleasant good afternoon, wherever you may be. At the time of his retirement, Scully was the last direct link the Dodgers organization had to the team's days in Brooklyn. The following year, the Dodgers advanced to the World Series for the first time in 29 years. Despite many Dodgers fans petitioning Scully to come out of retirement, including Fox Sports announcer Joe Buck (who was quoted as saying, "I swear on my late father, to have Vin come do some of the series with us and in my place would be an honor"), Scully declined, preferring to keep a low profile and responding that "I've done enough of them." Scully's decision echoed that of Myron Cope, who had retired after the 2004 season as the Pittsburgh Steelers color commentator, only to see the team advance to Super Bowl XL the following season and an unsuccessful fan petition to have Cope call that game. Scully did, however, take part in the first pitch ceremony prior to Game 2 with Steve Yeager and Fernando Valenzuela, teammates on the Dodgers team that won the 1981 World Series. In 1970, ABC Sports producer Roone Arledge tried to lure Scully to his network to call play-by-play for the then-new Monday Night Football games, but Scully's commitment to the Dodgers forced him to reject the offer. Instead, the role went to Keith Jackson for the initial year, before being replaced by Frank Gifford (from 1971 to 1985, when Gifford was in return, replaced by Al Michaels while Gifford converted into a color commentator up until 1997). Besides his sportscasting work, Scully was the uncredited narrator for the short-lived NBC sitcom Occasional Wife. Scully also co-hosted the Tournament of Roses Parade with Elizabeth Montgomery for ABC in 1967, served as the host for the NBC game show It Takes Two in 1969–70, and in 1973 hosted The Vin Scully Show, a weekday afternoon talk-variety show on CBS. In 1977, he hosted the prime-time Challenge of the Sexes for CBS. Scully was the announcer in the popular Sony PlayStation–exclusive MLB video game series by 989 Sports for a number of years. Scully has since retired from announcing for video games, with his final year involving the video game MLB 2005. Matt Vasgersian, Eric Karros, and Steve Lyons (and formerly Dave Campbell and Rex Hudler) have since taken over as the lead announcers in the video game series, which was retitled MLB: The Show. Scully appears as himself in the 1999 film For Love of the Game, has a brief cameo (along with then-Dodgers partner Jerry Doggett) in the 1961 film Bachelor in Paradise, appears as a CBS news reporter in the 1960 film Wake Me When It's Over, provides the opening narration in the 1966 film Fireball 500, and can be heard calling baseball games in the films Experiment in Terror (1962), Zebra in the Kitchen (1965), The Party (1968), and The Bucket List (2007), as well as in episodes of TV series including General Electric Theater, Alcoa Premiere, Mister Ed, The Joey Bishop Show, The Fugitive, Highway to Heaven, and Brooklyn Bridge. The surname of the Dana Scully character on the television show The X-Files is an homage to Vin Scully, as the show's creator Chris Carter is a Dodgers fan; Scully himself can be heard calling a game in the Season 6 episode "The Unnatural". Before Game 2 of the 2017 World Series, in which the Dodgers played the Houston Astros, Scully, Fernando Valenzuela and Steve Yeager worked together to throw out the ceremonial first pitch at Dodger Stadium. Harry Shearer has impersonated Scully in a sketch for Saturday Night Live, and has used the voice for The Simpsons when the storyline includes the fictional team the Springfield Isotopes. San Francisco Giants broadcaster Jon Miller is known for his impersonation of Scully. Voice actor Chris Cox has appeared on the comedy podcast series Sklarbro Country as the character "Racist Vin Scully". Scully received the Ford Frick Award from the National Baseball Hall of Fame in 1982, and was honored with a Lifetime Achievement Emmy Award for sportscasting and induction into the National Radio Hall of Fame in 1995. The National Sports Media Association (formerly the National Sportscasters and Sportswriters Association) named Scully as National Sportscaster of the Year four times (1965, 1978, 1982, 2016) and California Sportscaster of the Year 33 times, and inducted him into its Hall of Fame in 1991. He was the 1992 Hall of Fame inductee of the American Sportscasters Association, which also named him Sportscaster of the Century (2000) and top sportscaster of all-time on its Top 50 list (2009). The California Sports Hall of Fame inducted Scully in 2008. Scully was inducted into the NAB Broadcasting Hall of Fame in 2009. On May 11, 2009, he was awarded the Ambassador Award of Excellence by the LA Sports & Entertainment Commission. On an episode of MLB Network's series Prime 9 about the nine greatest baseball broadcasters of all-time, Scully was named #1. Scully has a star on the Hollywood Walk of Fame at 6675 Hollywood Blvd. Since 2001, the press box at Dodger Stadium has been named for Scully, and a street within the team's former Dodgertown spring training facility in Vero Beach, Florida was named "Vin Scully Way". WFUV, the Fordham University radio station that Scully helped found, presents an annual Vin Scully Lifetime Achievement Award for sports broadcasting. Scully himself was the inaugural recipient of the award in 2008. Scully served as the Grand Marshal for the 2014 Tournament of Roses Parade. Also, he participated aboard the Los Angeles Dodgers' 50th anniversary float in the 2008 Tournament of Roses Parade. On September 5, 2014, Bud Selig presented him with the Commissioner's Historic Achievement Award. He was the 14th recipient and (after Rachel Robinson) second non-player to receive the award, which was created to recognize accomplishments and contributions of historical significance to the game of baseball. Several honors were bestowed in 2016, Scully's final year. On January 29, the Los Angeles City Council voted unanimously to rename Elysian Park Avenue, which changed the address of Dodger Stadium to 1000 Vin Scully Ave. July 8 was dubbed "Vin Scully Day" by the acting governor of California, Kevin de León. During the pre-game ceremony on September 23, 2016, Los Angeles Mayor Eric Garcetti presented Vin Scully with the key to the city. On November 22, Scully received the Presidential Medal of Freedom, the highest civilian honor given by the President of the United States. In 2017, Scully's commentary for the final Brooklyn Dodgers/New York Giants game in 1957 was selected for preservation in the National Recording Registry by the Library of Congress as being "culturally, historically, or artistically significant." Also in 2017, Scully won the Icon Award as part of that year's ESPY Awards ceremony. At Game 2 of the 2017 World Series, being played at Dodger Stadium, Scully participated in a pre-game ceremony; addressing the crowd over the PA system, he implied that he was about to throw the ceremonial first pitch, and introduced Steve Yeager to serve as a ceremonial catcher. However, Scully then claimed that he couldn't actually pitch because he had hurt his rotator cuff, resulting in him introducing the actual ceremonial pitcher, Fernando Valenzuela. Scully also uttered his famous introduction, "It's time for Dodger baseball!". In 1972, Scully's 35-year-old wife, Joan Crawford, died of an accidental medical overdose; the couple had been married for 15 years. In late 1973, he married Sandra Hunt, who had two children of her own, and they soon had a child together. Scully's eldest son, Michael, died in a helicopter crash at the age of 33 while working for the ARCO Transportation Company. He was inspecting oil pipelines for leaks near Fort Tejon, California in the immediate aftermath of the Northridge earthquake in January 1994. Although Michael's death still haunts him, Scully, a devout Roman Catholic, has said in numerous interviews that he credits his religious faith and being able to dive back into his work with helping him ease the burden and grief from losing his wife and son. He has encouraged devotion to the Virgin Mary, saying, "Her prayers are more powerful than those of the rest of heaven combined. No one was closer or more devoted to Christ on earth, so it only makes sense to see the same thing in heaven. Now, the Blessed Virgin seeks to help her spiritual children get home to spend eternity with her Son." In 2016, Scully narrated an audio recording of the Rosary for Catholic Athletes for Christ in which he recites the Rosary mysteries and leads a group of responders. An unauthorized biography of Scully, Pull Up a Chair: The Vin Scully Story, written by Curt Smith, was published in 2009. For many years, Scully reportedly did not attend (or even watch on TV) a baseball game he was not announcing. It was not until 2004, when he and then-Dodgers owner Frank McCourt attended a game at Fenway Park, that Scully went to a pro baseball game as a spectator. Scully and McCourt took in another game at Fenway in 2010. In November 2017, Scully stated that he would "never watch another NFL game again" due to some of the league's players kneeling during the playing of the national anthem prior to games. Scully has four children, two stepchildren, sixteen grandchildren, and three great-grandchildren. He and his wife reside in Thousand Oaks, California. Scully attends St. Jude the Apostle Church in Westlake Village, California. ^ Oct 20, foxsports; ET, 2016 at 5:00p. "A look at baseball's best announcers". FOX Sports. ^ Sandomir, Richard. "Daffy Days of Brooklyn Return for Vin Scully"
^ "Pennsylvania Hotel". Retrieved September 24, 2014. ^ Henson, Steve (June 18, 2006). "Dodgers broadcaster ached to know his real father, but that was soothed by his stepdad". Los Angeles Times. ISSN 0458-3035. Retrieved August 11, 2016. ^ Shaikin, Bill (September 13, 2016). "Vin Scully won't call Dodgers playoff games". Los Angeles Times. Tronc, Inc. ISSN 0458-3035. Retrieved September 13, 2016. ^ Orfalea, Gregory (April 24, 2016). "The Rare Vin Scully". The Atlantic. Retrieved May 2, 2017. First and foremost comes his love of language, born of being a Literature major at Fordham. ^ "Vin Scully was at Yale, not to broadcast, but to play against future president". ^ Crowe, Jerry (July 27, 2009). "The day Vin Scully came in from the cold". Los Angeles Times. ^ "Mr. Pop 1957 Year In Review". ^ Creamer, Robert (May 4, 1964). "The Transistor Kid". Sports Illustrated. Retrieved April 15, 2009. ^ Olbermann, Keith (May 18, 2009). "Vin Scully, Voice Of The Yankees". MLBlogs Network. ^ Hall, John (May 27, 1976). "The Moments". Los Angeles Times. ^ Shaikin, Bill (August 28, 2015). "Dodgers' Vin Scully to return in 2016". Los Angeles Times. Retrieved August 29, 2015. ^ Ciniglio, Tony (August 29, 2015). "Vin Scully says realistically 2016 will "be the last one"". Los Angeles Daily News. Retrieved August 29, 2015. ^ Staff (September 13, 2016). "Vin Scully Won't Call Any Dodgers Postseason Games". CBS News. Retrieved September 19, 2016 – via CBS Los Angeles. ^ a b Weintraub, Rob (May 23, 2016). "The Day Vin Scully Didn't Land That N.F.L. Broadcasting Job". The New York Times. ^ Foster, Jason (August 31, 2015). "He's been everywhere: Why Vin Scully is baseball's Forrest Gump". The Sporting News. ^ Sandomir, Richard (March 21, 1998). "Scully signs off World Series radio". The New York Times. ^ "Charley Steiner". Retrieved September 24, 2014. ^ "So, about the Dodgers' radio coverage, in the presumed absence of a Vin Scullly call ..." Retrieved September 24, 2014. ^ Zinser, Lynn (April 10, 2012). "Scully Misses Dodgers Opener With Illness". The New York Times. ^ "Vin Scully talks schedule for last year behind microphone". ESPN.com. Retrieved February 1, 2016. ^ "Dodgers honor Vin Scully with pregame ceremony". ESPN.com. Retrieved September 24, 2016. ^ Landers, Chris (September 25, 2016). "We've got everything you need to see and hear from Vin Scully's final home game". MLB.com. Retrieved October 3, 2016. ^ "Dodgers to simulcast Vin Scully's final broadcast on radio". SB Nation. Retrieved October 1, 2016. ^ Duarte, Michael (October 2, 2016). "San Francisco Giants Sweep Dodgers on Vin Scully's Final Game". Los Angeles: KNBC. Retrieved October 2, 2016. ^ Hoffarth, Tom (October 20, 2017). "Vin Scully: 'I honestly don't belong' in the World Series broadcast booth". Orange County Register. Retrieved October 26, 2017. ^ Mitchell, Houston (October 25, 2017). "Vin Scully steals the show in pregame ceremony". Los Angeles Times. Retrieved October 26, 2017. ^ "Vin Scully". IMDb. Retrieved September 24, 2014. ^ "WS2017:Scully,Valenzuela,Yeagerpumpupcrowd". MLB. Retrieved November 29, 2017. ^ "Joe and Vin Review Bob Uecker's Performance". NBC. October 13, 1984. Retrieved October 2, 2016. ^ Snibbe, Kurt (October 2, 2016). "Focus: Vin Scully and other great Southern California sportscasters". Orange County Register. Retrieved October 2, 2016. ^ Schultz, Bradley; Arke, Edward T. (October 14, 2015). Sports Media: Reporting, Producing, and Planning (e-book) (third ed.). Routledge. ISBN 9781317449263. Blunt, Larry (2004). "Rounding the Bases". In Land, Gary (ed.). Growing Up with Baseball: How We Loved and Played the Game. University of Nebraska Press. p. 59. ISBN 9780803229754. ^ "3hree Things: Two Guys, One Mic". Heard Mentality. October 12, 2010. Archived from the original on April 16, 2011. Retrieved September 24, 2014. ^ "1982 Ford C. Frick Award Winner Vin Scully". Archived from the original on September 14, 2014. Retrieved September 24, 2014. ^ "NSMA News Release on 2016 Award Winners & 2017 Hall of Fame Inductees". nationalsportsmedia.org. Retrieved May 7, 2018. ^ "ASA's Top 50 Sportscasters of All Time". American Sportscasters Association. Retrieved September 24, 2014. ^ "Chris Schenkel named 25th greatest sportscaster of all-time." Article at www.pba.com, January 15, 2009. ^ "Vin Scully". Archived from the original on August 31, 2013. Retrieved September 24, 2014. ^ "Vin Scully to receive Sports & Entertainment Ambassador Award of Excellence from Los Angeles Sports & Entertainment Commission". ^ Dougherty, Pete (February 23, 2010). "MLB Network offers its top nine baseball announcers". Times Union. Retrieved September 20, 2012. ^ Simers, T.J. (April 22, 2001). "Scully should be heard when talk is of greatness". Los Angeles Times. ^ Springer, Steve (July 12, 2008). "There's no going back to Vero Beach". Los Angeles Times. ^ Mushnick, Phil (April 27, 2008). "Voice of Praise". New York Post. ^ Dilbeck, Steve (September 9, 2013). "It's a natural: Dodgers' Vin Scully chosen Rose Parade grand marshal". Los Angeles Times. ^ "Vin Scully honored with Commissioner's Historic Achievement Award". mlb.com. September 5, 2014. Retrieved September 5, 2014. ^ de León, Kevin (July 8, 2016). "Acting Governor Issues Proclamation Declaring Vin Scully Day" (Press release). Senate President pro Tempore Kevin de León (official). Retrieved November 16, 2016. ^ Garcetti, Eric (September 23, 2016). "Mayor Garcetti to Present Vin Scullt with the Key to the City at Tonight's Dodger Game" (Press release). Office of the Mayor, City of Los Angeles (official). Retrieved November 22, 2016. ^ Shaikin, Bill (November 16, 2016). "Vin Scully to receive Presidential Medal of Freedom". Los Angeles Times. Retrieved November 16, 2016. ^ "ESPYS 2017 Winners: The Complete List". E! Online. July 13, 2017. ^ "Beloved Scully delights Dodgers fans at Game 2". ESPN. Retrieved October 26, 2017. ^ "Scully's Fame Meets with Approval". The Dispatch. Retrieved September 24, 2014 – via Google News Archive Search. ^ "Pull Up a Chair: The Vin Scully Story: Curt Smith: 9781597976619: Amazon.com: Books". Retrieved September 24, 2014. ^ Axson, Scooby (November 5, 2017). "Vin Scully on Player Protests: 'I Will Never Watch Another NFL Game Again'". Sports Illustrated. Retrieved November 4, 2018. ^ Gestro, Claudia (October 8, 2015). "Vin Scully will miss calling postseason". Los Angeles Post-Examiner. Retrieved December 10, 2016. ^ "Two Catholics and the Catholic Game - George Weigel". First Things.